Quality heating is the key element to comfort during chilly weather. This Astoria electric fireplace requires no venting or gas lines to distribute 4,600 BTUs of fan-forced heat evenly throughout an area of up to 400 square feet. Plug this fireplace into any standard 3-prong 120V outlet for an attractive centerpiece that operates with or without heat. The temperature is automatically controlled by the thermostat for maintaining consistent comfort. 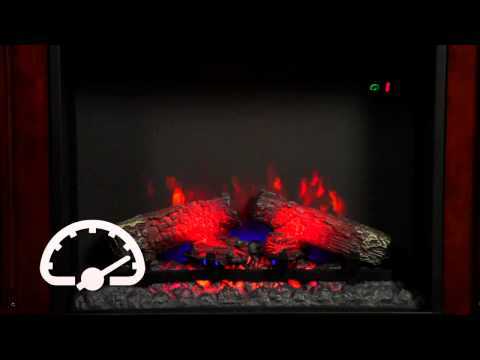 The digital temperature display fades out if untouched, keeping the solid glass front uninterrupted while showing off the realistic undulating glowing ember bed and resin log set. The downlight option allows light from the top of the firebox to be cast down onto the interior display, illuminating the logs and ember bed. The glass remains cool whether the heater is on or off, and the heater vent includes a child safety screen. Incandescent light enhances the flickering flame, and the 5 flame brightness settings can easily be adjusted with the control knob. This fireplace boasts a stunning solid dark Emperador marble top mantel and marble surround. The fluted half round columns and carved capitals enhance the elegant design of this electric fireplace. The decorative corbel center compliments the detailed applied molding, and the metal fire grate adds a unique finishing touch to this fireplace. Energy efficient, all LED technology offers low cost operation. Complete with a multi-function, 4 button remote, the 33WM0194-C232 fireplace is easily assembled to deliver fast, efficient heat where you need it. 34" 72" 60" 70 1/2"